This Primer on Project Management and ICTD provides fundamental concepts and tools utilized in project planning and management. There are two parts to this Primer. Part 1 discusses general concepts and tools in project management for development, as well as the use of general computer applications. This part is intended for students without any or limited technical background on ICT. Part 2 looks into the use of ICTs in managing projects and delves into tools and techniques for managing ICTD projects. This second part will be more appropriate for students with some technical information technology background. 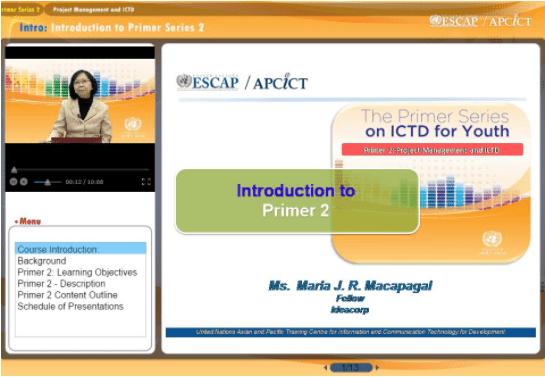 While this Primer is specifically focused on ICTD project management concepts, tools, and techniques, it is anchored on the development framework comprehensively discussed in Primer 1: An Introduction to ICT for Development. Primer 1 provides a foundation for understanding how ICTs can be used for social and economic development, in particular in meeting a country's development goals and needs. Case examples of ICTD initiatives that support the Millennium Development Goals and other socio-economic development programmes are given in this Primer. Some of the case examples will be taken from Primer 1 and related sources. This Primer will also include fictitious case studies for the purpose of exemplifying the use of project management concepts, tools and techniques, and for enriching discussions and analyses. These case studies use imaginary characters and places but they are mostly based on real life lessons and experiences. Aside from the case studies, activities and simulation exercises are provided and suggested for knowledge and skills application. Throughout these learning activities, students are expected to be analytical and critical. Describe the project management profession in the context of development and ethics, and the importance of leadership, teamwork, communication, and stakeholders’ participation in managing change. Develop a simple project management plan in the context of development, and use project management and ICT tools as a method for advancement. Maria Juanita R. Macapagal has over 18 years of work experience in development management encompassing project planning, implementation, monitoring and evaluation, and capacity building in various development fields. She has helped implement institutional strengthening strategies in the private sector and in government and non-governmental organizations in the Philippines and in other parts of South-East Asia. She has also worked as a consultant for CIDA-funded projects, such as the Electronic Governance for Efficiency and Effectiveness project, Policy Training and Technical Assistance Facility, and the Philippines Canada Cooperation Office.